Aaron Cole April 4, 2019 Comment Now! The former was a 1980s wonder machine that helped set the table for a tradition of sleeper sedans, and the latter is a modern-day masterpiece—a coveted V-8 thundersedan that hates its tires and it shows. This E 53 AMG isn’t either. It’s a better weapon to slay long cruises in superlative comfort with better-than-reasonable fuel economy for a sedan with more than 400 horsepower. As the latest sedan (or coupe or convertible, if you prefer) to sport an AMG 53 badge, the E 53 AMG is a mild Dr. Jekyll/Mr. Hyde ride with luxury creds in all the right places: standard air suspension, available nappa leather hides, and Burmester sound. Its silky-smooth, force-fed inline-6 with 429 horsepower has enough gusto to bite, but not enough to chew through tires like its V-8-powered E63 AMG stablemate. It’s better for the balance, and better not to be compared to anything with a V-8—doing that gives short shrift for an engine that’s a marvel in its own right. 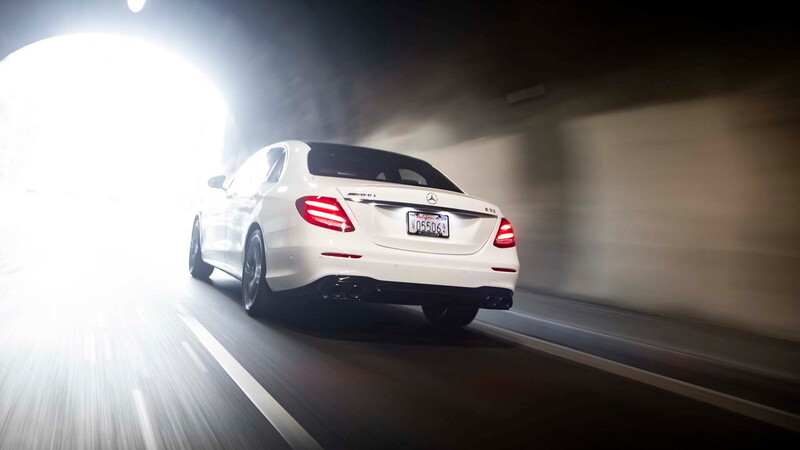 Like the E 43 that it replaced, the E 53 ascension up the AMG ladder stops short of the V-8 rung. The 53 series will eventually replace the whole AMG 43 lot, eschewing turbocharged V-6s in favor of boosted inline-6s with the same displacement, but completely unique geometry. At its heart—no, really at the crankshaft—is the E 53 AMG’s gift to the world: a 21-hp, 184 pound-feet integral starter generator that pushes supplemental power down the driveline, spools up a turbo, and can “coast” the car at nearly every speed to save fuel. The starter generator feeds the E 53’s turbocharger at low rpm, too, and torque fills boost before exhaust pressure can spin up the snail riding sidesaddle on the inline-6. 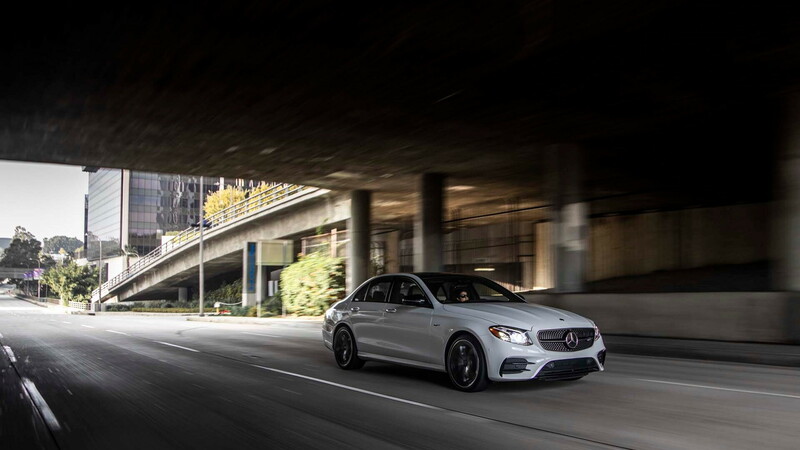 The E 53 AMG launches directly and without drama; its standard all-wheel-drive system shuttles up to 100 percent of power toward the rear wheels (the fronts never take more than 50 percent of the power), and the inline-6 braps out overrun in sportier modes with gleeful artifice. My rain-soaked launches in Northern California were a taste of the E 53 AMG’s potential for straight-line speed, but even on the damp roads, the sport sedan seemed reticent to transmute its wide, optional 275/30 R20 Pirelli tires from rubber solids into hillbilly smoke. That’s fine, the E 53 AMG is no performance poseur. 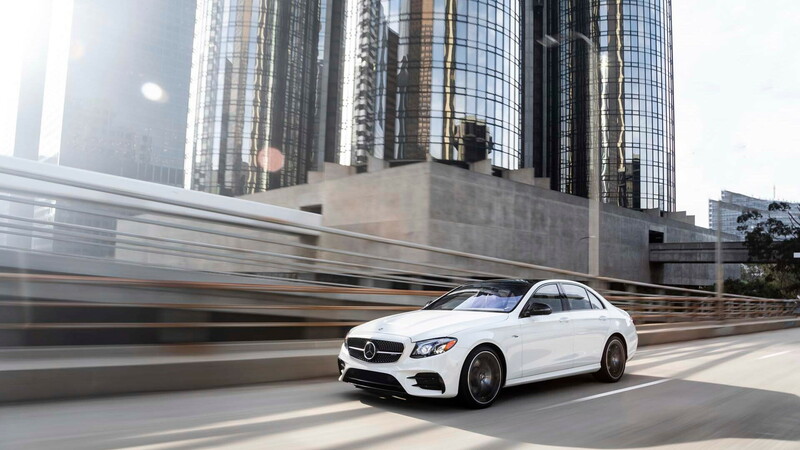 Mercedes-Benz quotes a 0-60-mph sprint in the sedan and convertible at 4.4 seconds (4.3 seconds in the coupe). That’s nearly identical to the 4.5-second spring in the outgoing E 43, effectively negating the 33 hp advantage over last year’s models by adding 200 pounds more gear, including a standard air suspension. Its brisk and quick, and nearly as quick to 60 mph as the E 63 from less than a decade ago. The new E 53’s advantage isn’t only from the trick starter generator, but also in the new 3.0-liter inline-6. The inline-6 has been used in other applications before—CLS 450 and GLE 450 to name two—but not yet in the E-Class. The engine is the straight man to the E 53’s boost brothers’—turbo and starter generator—schticks. 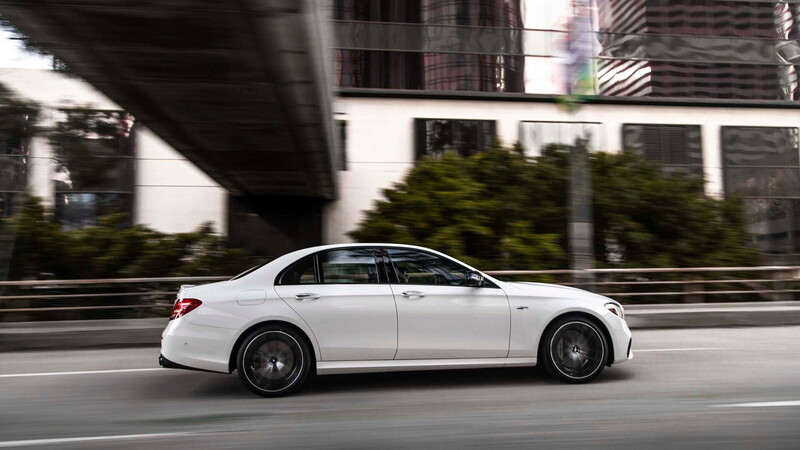 The straight-6 has one fewer cam than the V-6, a more seamless start-stop system, and a higher-strung, but more pleasurable, exhaust note compared to the V-6 found in the E 450. 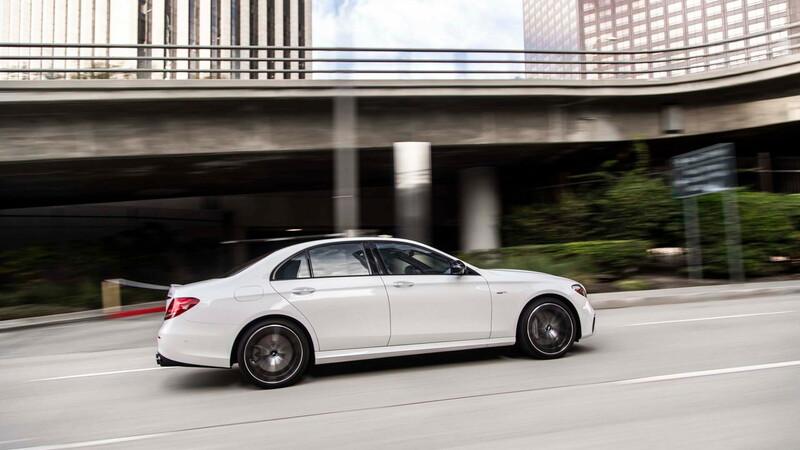 It drives better than before, although this generation of E-Class has been no slouch on the road in any configuration. The foil, if any, is that the 9-speed automatic hooked to each AMG 53 lives under a shadow of 8-speeds found in competitors that wear initials with letters such as PDK or ZF. In normal drive modes, the 9-speed happily serves more cogs in the name of fuel economy, but in Sport and Sport+ modes, the chunky upshifts aren’t as guttural and pleasing as BMW or Porsche’s rifle-precise shifts. The 9-speed sings at long-distance cruises, however, and keeps the E 53 dangerously close to 30 mpg on the highway despite its deep wells of available power. There is a small menu of E 53 body styles to choose from, all with the same powertrain. The crib notes version: The E 53 coupe is marginally harder edged, beautifully styled, and less practical. The E 53 convertible is gorgeous and heavy, perhaps a tinge softer than the coupe, but necessary hardware on coastal cruises. The E 53 sedan I’m driving is neither of the above and I’m looking for its hook. Inside the beautifully wrought interior, the sedan charms with its available in-cabin fragrance dispenser and soft black nappa leather seats with red contrast stitching. It wears a brilliant shade of Iridium Silver that nearly matches the color of the porous clouds on this rainy Northern California day. This E 53 has more than $26,000 in options to add to its $72,550 starting price and its bottom-line balloons to within earshot of six figures. I’d skip none of those options, and here are my highlights: a $1,100 acoustic package upgrade that silences the outside world with thicker glass and more sound-deadening; a $2,550 driver assistance package that adds active lane control and driver-assistance features that serve the E 53 AMG’s mission as a long-distance cruiser; and of course a Burmester sound system that nearly makes Chopin my co-pilot. And that’s really the best place for this sedan anyhow. If the E 53’s lineage includes the Hammer, this sedan’s an icing spatula. It’s smoother than the bunch and even sweeter.